We all love cornbread here. You can vary the flour/cornmeal ratio a bit depending on how heavy you want it. I use buttermilk, yogurt or plain milk, depending on what I have around. When my eldest was a child, she would happily break up chunks of leftover cornbread into a bowl, cover with milk and heat it up for breakfast the next morning. 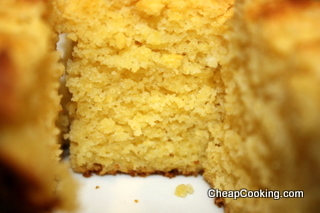 Or if you have chickens they will go bananas for leftover cornbread! You can also use leftovers to make cornbread stuffing, of course. Oh, and I more recently discovered this cornbread salad! Mix together cornmeal, flour, baking powder, salt, brown sugar, and dry milk. In a small bowl or measuring pitcher, mix together eggs, milk, and melted shortening. Add the wet ingredients to the dry and stir just until moistened. Pour into a greased 9×9 pan and bake 25 minutes. Options: Pour into muffin tins instead. This can also be made with buttermilk but reduce the baking powder to 2 tsp. and add 1 tsp. baking soda.